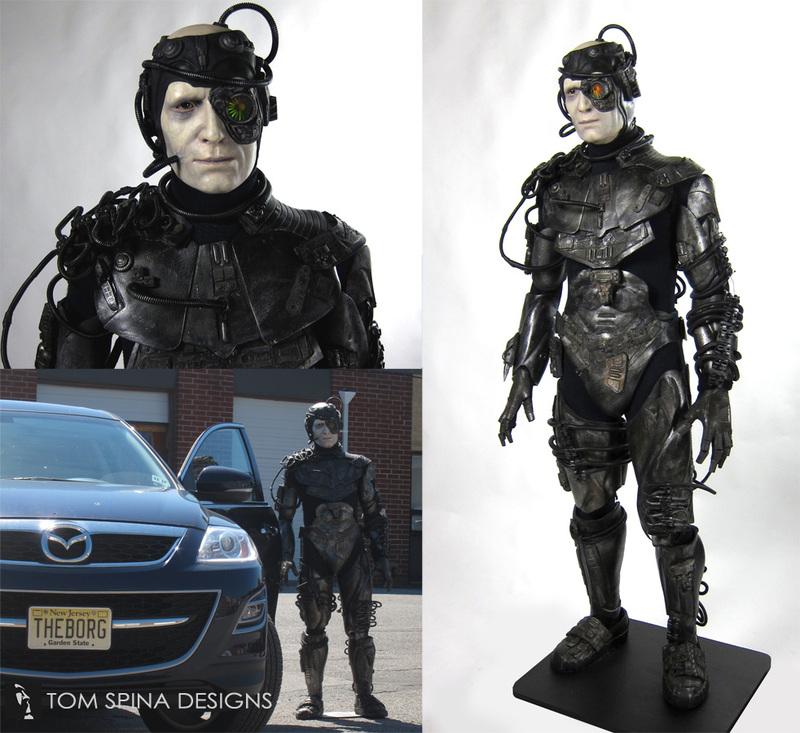 Custom mannequin to create a wax statue style display for a Star Trek Borg costume from TV and Film. Our client was looking for a custom display for his original Star Trek Borg costume used in the Next Generation television series and film. 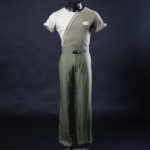 He had most of the costume, but not all. 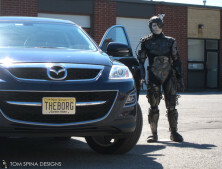 Since we create costumes as well as custom displays, partial costumes can be completed with appropriate, authentic-looking replacements and brought together on a life-like custom mannequin. Since our client had most of the costume from the neck down we created a custom display mannequin to display the costume as well as a sculpted head to bring the piece to life. 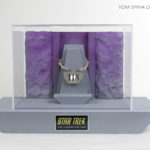 The cowl was actually a part of a 1995 licensed Star Trek Borg makeup kit by Michael Westmore, who was the makeup supervisor for the entire series. 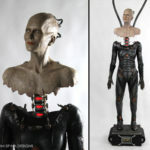 The television and movie costume pieces showed some light production and post-production damage, several pieces had come loose from the bodysuit and needed minor repair. Focusing on the end goal that the pieces should look good for their age, not so pristine that they look like replicas, we performed our repairs with a very light touch. Once all of the pieces of “armor” and “Borg technology” were back in place on the costume, we began to assemble the mannequin. 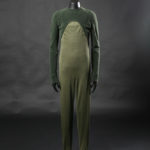 We had to create a mannequin who was the same size as the actors who originally wore the costume for a perfect fit. We then began work on the Borg’s head, to get the realistic look of human skin we combined many hand painted layers with some subtle airbrushed details. These layers and details plus his glass eye bring the sculpture to life. 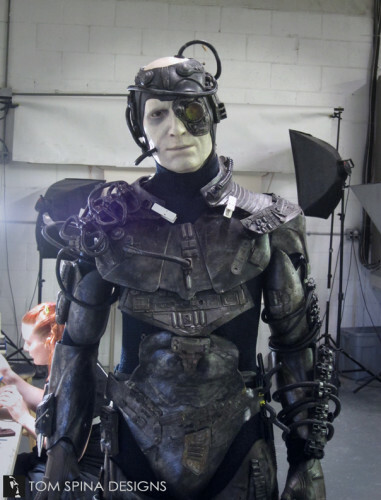 We made sure to give the head sculpture a hint of sadness, to reflect the fact that this Borg didn’t didn’t choose to be a villain! Then we mounted the licensed cowl to head attaching tubing from the cowl to the head through some scars we sculpted to give the impression that they are puncturing the skin. 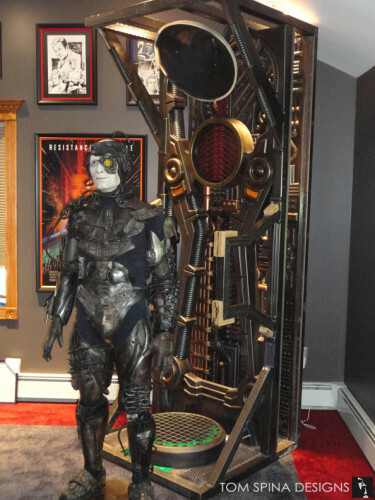 The end result is a stunning life sized statue, and much better than a costume on a hanger (or worse, in storage! ).